"This poor guy—figuratively speaking—contorting himself just to win a few votes." 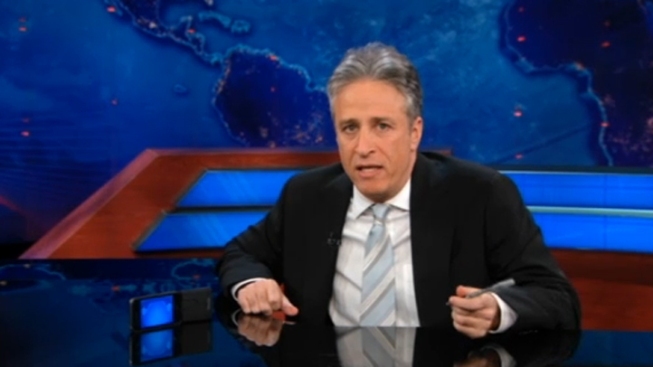 Jon Stewart is wary of Romney's "Southern Strategy." Last week, on-again-off-again GOP front-runner Mitt Romney christened himself an "unofficial Southerner" during a speech in Pascagoula, Mississippi. The former Massachusetts governor joked, "I'm learning to say 'y'all' and I like grits. Strange things are happening to me." At another campaign event, Romney affected a Southern twang ("Morning y'all!") and touted his Dixie-style breakfast. "I got started right this morning with a biscuit and some cheesy grits," he said. "I'll tell you! Delicious." On the eve of the primary battle in Mississippi and Alabama on Tuesday, Stewart knocked Romney's "Southern Strategy" and not-to-subtle "Southern-fried pandering" to Dixie sensibilities. "This poor guy—figuratively speaking—contorting himself just to win a few votes," Stewart said. Stewart began the segment with a primer on the notorious Southern Strategy by which Richard Nixon, playing on "racial fears" in the former Confederacy, won the White House in 1968 and effectively reshaped American electoral politics. But according to Stewart, Romney's "Southern Strategy" owes less to Machiavellian political calculation and more to Jeff Foxworthy's stand-up schtick — a likely possibility, since the popular Georgia-born comic endorsed Romney and campaigned with him in Alabama. Riffing on Foxworthy's well-known "You Might Be A Redneck" routine, Stewart donned a Foxworthy-style bushy mustache and put a Blue Collar Comedy spin on Romney's deep-pocket Rockefeller Republican roots. "If you have a car on your front lawn 'cause your garage only holds five cars, if you go to the diner and order your eggs fabergé, if you think 'Cloverfield' was a movie about your butler — you might be a Romney," Stewart joked.